Funds Now gives you instant access to money from your sales. 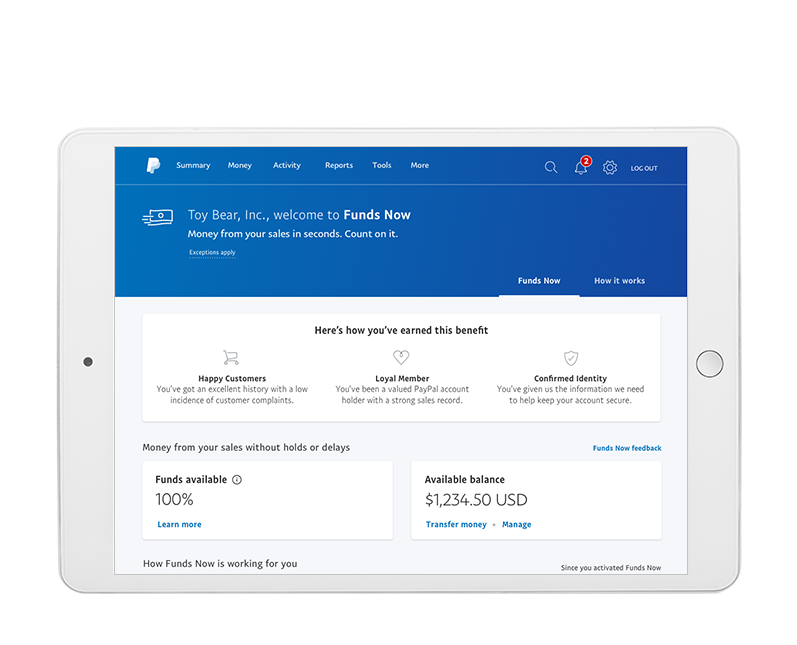 With Funds Now, money from your completed sales will be available in your PayPal balance within seconds – even during a dispute – at no extra cost to you. A leading benefit available only to select sellers, Funds Now helps you reach your business goals by giving you money from your completed sales within seconds. What Funds Now promises is that, in the future, money won't be held even during disputes. No more holds, no more delays – at no extra cost to you. In rare cases, delays may still occur to help protect your account, e.g., if we suspect you've received a payment from a fraudulent buyer. Who is eligible for Funds Now? Here are a few of the key areas we consider for qualified sellers. Make a sale via any marketplace, website, PayPal Here, or invoicing via PayPal. Money from your completed sales is sent directly to your PayPal balance within seconds. Transfer the money to your bank with our flexible withdrawal options or start using it instantly from your PayPal balance. Interested in instantly accessing money from your sales? Not eligible for Funds Now yet? Don’t worry we’ve got your back. If you are not eligible we will not make any changes to the way you currently receive the money from your sales. We’re constantly evolving our security systems to help keep transactions secure. Plus, our Seller Protection1 program will help protect your online sales, minimize claims and chargebacks, and help prevent fraud. You concentrate on growing your business, while we take care of the rest. Funds Now is available to select PayPal account holders in good standing and may be withdrawn, suspended or modified at PayPal’s discretion. Exceptions apply (see How it Works). 1 Seller Protection is available on eligible purchases. Limits apply.